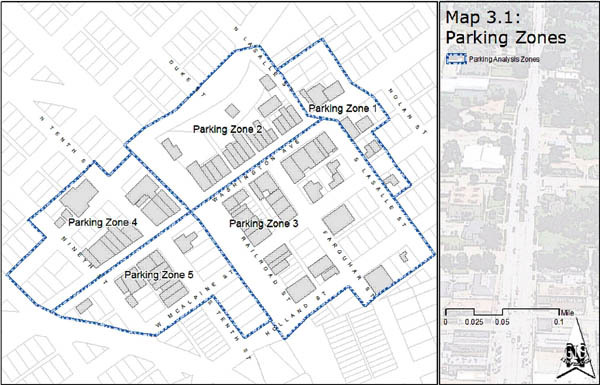 To facilitate a detailed discussion of the datasets presented previously, parking within Downtown has been broken into five parking zones (see Map 3.1). 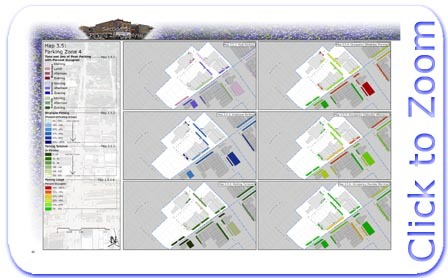 The zones were drawn with the intent of identifying activity centers where a visitor or employee can park and visit several destinations without moving his or her vehicle. In most cases major barriers such as railroad tracks or highways were used as buffers between the zones. It is expected that a typical customer or employee can easily park within a given zone and walk to his or her destination without encountering fast moving traffic or trains. Section 3 is an analysis of all collected data for each zone. Parking Zone 1 is located in the extreme eastern end of Downtown. Some businesses found here include a bank, movie theater, restaurant and various offices. The Grimes County Chamber of Commerce is also located in Zone 1. Most buildings are at or close to full occupancy. The zone is dominated by off-street parking. 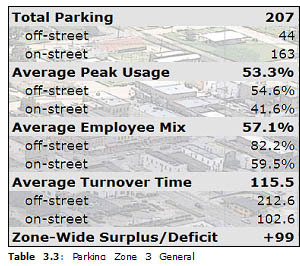 During the workday no parking shortages were observed with parking lots at the Filling Station Diner and bank/office buildings more than adequately handling parking needs, rarely exceeding 50% occupancy (see Map 3.2.4, 3.2.5). In the evenings these parking lots in addition to on-street parking are utilized by both restaurant and movie theater patrons. This shift in use is most evident on Saturday nights, when on-street parking directly in front of the theater reaches 85% occupancy (see Map 3.2.6). 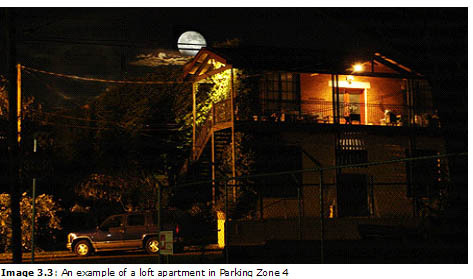 The parking groups within the zone experience an average occupancy of 44.4% at their respective peaks. Turnover time for parking in the rear of the bank/office building exceeds an hour as does the parking lot serving the diner (see Map 3.2.3). With the nature of these businesses and relative abundance of parking, turnover time for these lots is not a concern. On-street parking is used nearly exclusively by customers with employee parking frequently occurring in off-street parking lots (see Map 3.2.2). Peak parking for Zone 1 is split between weekdays and Saturday evenings (see Map 3.2.1). Given current land use levels and the observed peak occupancy rates for each parking group, an average surplus of 66 parking spaces is expected. Access to the Washington Avenue/LaSalle Street traffic light provides safe crossings of Washington Avenue making this the only parking zone spanning this thoroughfare. Zone 2 is bounded by Washington Avenue in the south, LaSalle and Railroad Streets to the east and west, and Cedar Creek to the north (see Map 3.3, opposite page). The zone includes many structures fronting on Washington Avenue as well as those located around Cedar Creek. Retail and service businesses dominate the zone including antique, clothing, and automotive related commercial activities. Two restaurants are also located within this zone. Most buildings in the zone have their first floor occupied with some form of commercial use; however, several buildings have upper floors which are either vacant or used for storage. Of the 86 parking spaces located in Zone 2, 61 (71%) are located in off-street parking lots. 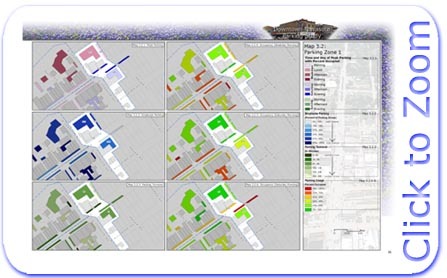 The City maintains two lots consisting of 44 spaces, with the rest maintained by private owners. Peak occupancy is observed mostly on weekdays, with some on-street parking in the southern part of the zone reaching peak on Saturday mornings (see Map 3.3.1). 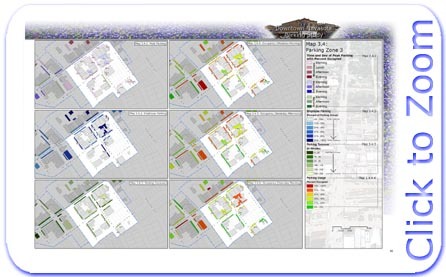 At their individual peaks, the parking groups within the zone average 53.3% occupancy. 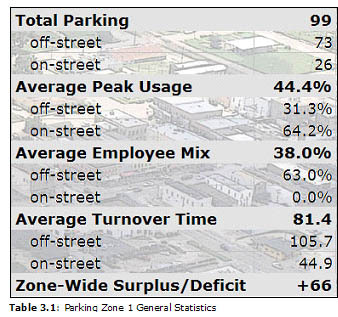 On-street parking does experience some shortages with occupancy rates at peak, between 60% and 80% occupancy. By contrast, the rear parking lots average only 40% occupancy throughout the day, with only two parking groups exceeding 50% occupancy at their individual peaks. 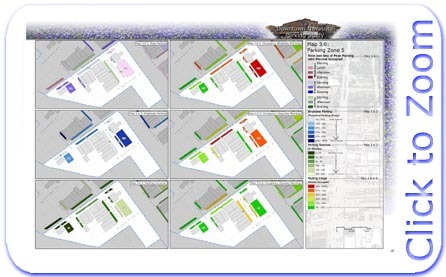 Parking patterns vary greatly depending on day of the week (see Map 3.3.4, 3.3.5, and 3.3.6). At current land use and parking conditions a surplus of 45 spaces exists for this zone overall. Turnover time in Zone 2 is also relatively high, even among on-street parking groups in front of retail establishments (see Map 3.3.3). Parking turnover times on Washington Avenue between Duke and LaSalle Streets exceeds 70 minutes, while the rear parking lots experience an average of more than two hours. In these parking lots a slow turnover time is expected due to high levels of employee parking, with these lots averaging around 80% employees (see Map 3.3.2). In most urban parking areas this type of situation is desirable as a way to reserve on-street parking for customers. However, high levels of employee parking is also observed in this zone for on-street parking. 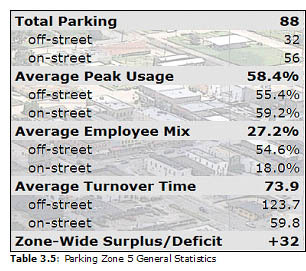 The two on-street parking groups along Washington Avenue have employee parking percentages at 63% and 36%. Accessibility between buildings fronting on Washington Avenue and parking lots in the rear varies drastically by location. Three breaks in the fa�ades provide potential pedestrian access with varying levels of use (see Figure 3.1). Safety concerns for employees utilizing these alleys were expressed during public involvement for the Navasota Comprehensive Plan Project. Inadequate lighting, poor or nonexistent landscaping, insufficient visibility from the sidewalk, and unregulated interaction between automobiles and pedestrians were some of the frequently mentioned problems with these alleys. During fieldwork, Alley 1 was the only alleyway observed as having frequent pedestrian use. This alley, the one closest to LaSalle Street, possesses many positive design elements which should be incorporated into the other alleys within Downtown. Access between Zone 2 and Zone 3 is also limited due to high traffic volumes on Washington Avenue. The only traffic calming provided on this thoroughfare is on-street parking. While on-street parking is a very effective means of slowing traffic, few employees or customers were seen parking in one zone and crossing to the other except when their destinations appear to be very close to the traffic signal at LaSalle Street. This lack of mobility between the two zones may limit the usefulness of off-street parking in Zone 2 as a potential location for employees of Zone 3. 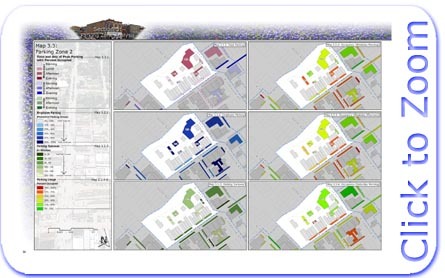 Parking Zone 3 is the largest and most complicated of the five parking zones within the study area. It is crossed or bound by six streets including two State Highways. With 207 parking spaces it also contains the largest overall quantity of parking. However, of this large supply, only 44 spaces (21%) are located in off-street parking lots with the vast majority of parking in the zone located on-street. Also, unlike most other lots in Downtown, the two parking lots located in this zone are primarily reserved for employees and/or residents of adjoining buildings and are not commonly utilized for employee parking. A wide variety of land uses are located here including three city government buildings, the United States Postal Office, and a variety of retail and service establishments. One restaurant and several units of loft apartments are also located in the zone. Most of the structures have at least the first floor occupied by commercial activities; however, several buildings have upper floors used for storage or left vacant. 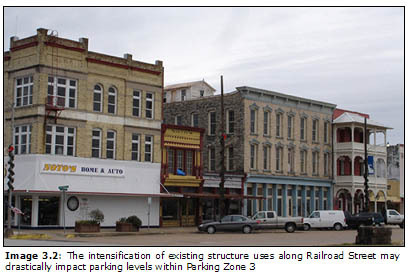 The 200 block of Railroad Street is a site consisting of several vacant one and two-story structures specifically discussed in the 2004 Navasota Economic Development Plan as a possible location for redevelopment. 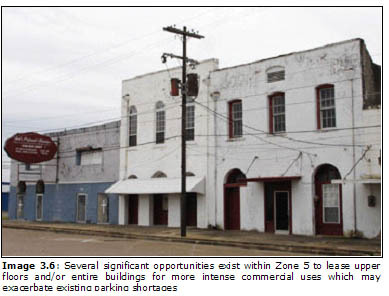 Parking Zone 3 also contains several multi-lot tracts of vacant land, and may develop as a variety of uses as redevelopment efforts proceed either alleviating or exacerbating the existing parking situation within the zone. This zone experiences some of the most noticeable parking shortages in Downtown, with some groups averaging 53.3% occupancy at their peak times (see Map 3.4.1). All but one of the parking groups experience their peak occupancy on weekdays with the remaining group dominated by church parking on Sundays. On-street parking groups located on Washington Avenue in the 100 block of Farquhar and Railroad Streets are particularly troubled with an average occupancy among these groups of 70.1% at peak (see Map 3.4.4, 3.4.5). While parking in this area does experience regular shortages, overall the zone is currently benefiting from a parking surplus of 99 spaces. Many land parcels and vacant floors are open for development or lease; therefore the projected surplus may rapidly diminish depending on development patterns. With the exception of the parking groups surrounding the Police Station and United States Postal Office, turnover time for on-street parking in this zone easily exceeds an hour (see Map 3.4.3). The quick turnover times near the Police Station and Postal Office contrasted with overall slow turnover times is a possible result of relatively few off-street parking lots. Partly confirming this theory are statistics on employee parking which show that employees appear to be the primary driver of slow parking turnover. The employee to customer mix reveals that employee occupancy is averaging in the low 60% range for parking groups with the previously mentioned parking shortages (see Map 3.4.2). The parking group nearest to City Hall on Farquhar Street for example has a 75% employee parking level. Unlike Parking Zone 2, Zone 3 does not have large reserves of off-street parking lots. Parking for small groups of employees is available in some alleys, but of the large employment centers only the Police Station and the Postal Office have reserved off-street parking. 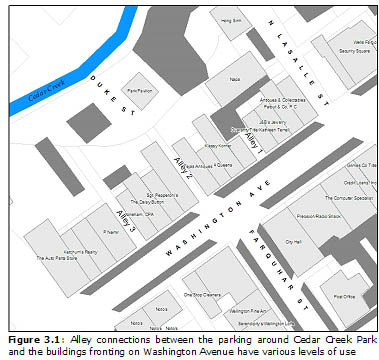 To further complicate parking problems, the difficulty of crossing Washington Avenue and the intimidating alley connections mentioned in the discussion of Parking Zone 2 tend to discourage employees from parking in the relatively vacant parking lots near Cedar Creek. Parking Zone 4 lies between the Railroad Street right-of-way and Eighth Street, with Washington Avenue to the south (see Map 3.5, opposite page). Parking is found exclusively in the form of on-street parking with a total of 55 spaces available. Land uses within the zone include retail, service, entertainment, religious, and residential. Among the residential uses are several loft apartments (see Image 3.3). 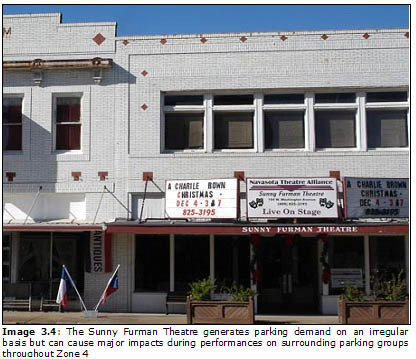 The Sunny Furman Theatre and Video Express makeup the entertainment oriented land uses in Zone 4 (see Image 3.4, Page 44). Several buildings are completely vacant or have vacant upper floors which may alter the parking situation as more intense redevelopment occurs. In addition, some two-story structures also have basements. As well as vacant space within some buildings, Parking Zone 4 also includes several sites which are currently either unimproved or used for outside storage activities. Retail or entertainment oriented development on these sites may also alter the existing parking situation. Parking shortages do not appear to be a problem at present with only three parking groups exceeding 50% occupancy at their respective peaks. In fact, most parking groups remain below 30% occupancy on average (see Map 3.5.1). However, occasional shortages are observed during religious services. One factor contributing to the lower number of parking problems may be the diverse mix of land uses within the parking zone. For example, several buildings along the 100 and 200 blocks of Washington Avenue contain both vertical and horizontal mixed-use. Activities found in these buildings including entertainment, residential, retail, and religious. As a result, on-street parking groups within the zone experience peak demand on a variety of days including weekdays, Saturdays, and Sundays. The average occupancy rate at peak within the zone is 41.2%. Given current land use conditions this zone has a parking surplus of 34 spaces. Turnover for on-street parking along Washington Avenue averages well below an hour, while turnover on Tenth and Ninth Streets ranges between one and three hours. No commercial buildings currently front on either of these streets; therefore parking duration is of little concern at present (see Map 3.5.3). Employee parking is limited almost exclusively to the side streets, with employees accounting for only 10% of vehicles parked along Washington Avenue (see Map 3.5.2). Parking Zone 5 mirrors Zone 4 on the south side of Washington Avenue (see Map 3.6, Page 47). 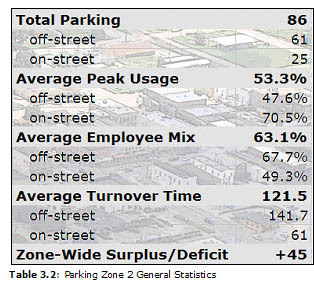 The zone has a total of 88 parking spaces with most found on-street. The remaining 32 spaces (36%) are located within two off-street parking lots. Principal land uses within the zone are service, banking, retail, and religious. 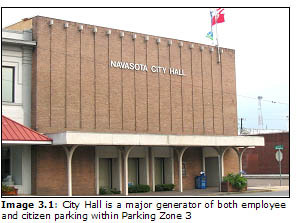 The Bank of Navasota is a particularly large employer and destination within this zone likely to generate both long and short term parking usage (see Image 3.5). A significant number of structures and sites are potential locations for redevelopment, including vacant upper stories as well as vacant buildings. Many of these structures are located along Tenth Street (see Image 3.6). As with Parking Zone 4, parking groups within Zone 5 reach their peaks at many different times and days during the week (see Map 3.6.1). The churches and retail establishments see high volumes of traffic early in the day on Saturdays and Sundays; while the service institutions primarily peak on weekdays during the business day. High parking demand was observed along Washington Avenue between Tenth and Ninth Streets near the Navasota Emporium and Creative Signs & Graphics, at over 85% occupied on Saturday mornings and over 70% throughout the day during the work week (see Map 3.6.4, 3.6.5, 3.6.6). The overall occupancy rate for parking groups within the zone at their individual peaks is 58.4%. Off-street and on-street parking near the Bank of Navasota building also experience high occupancy rates on both weekdays and Saturday mornings. However the zone has an observed surplus of 32 spaces. 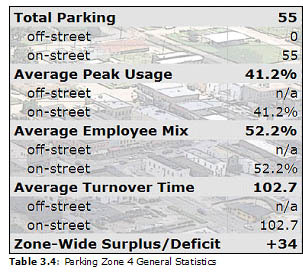 Of the areas within Parking Zone 5 experiencing parking shortages, turnover time does appear to be a significant factor. The on-street parking identified with 70% occupancy during the workweek has a turnover rate of nearly 75 minutes (see Map 3.6.3). 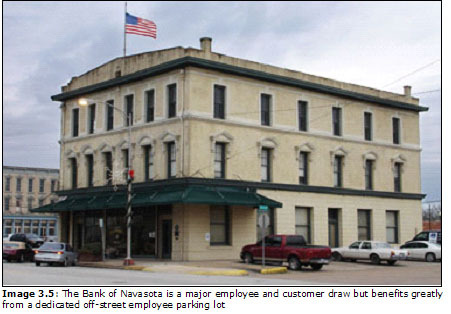 Parking behind the Bank of Navasota building averages nearly three hours in terms of turnover. By contrast, the on-street parking near the entrance of the Bank of Navasota building exhibits some of the fastest turnover within Downtown, averaging less than 30 minutes. The location of employee parking appears to play a large factor in turnover rates for parking groups in the zone. The groups mentioned as having slow turnover and high occupancy all have high levels of employee parking as well (see Map 3.6.2). Parking behind the Bank of Navasota would be expected to exhibit high employee parking rates as these lots are designed specifically for that purpose. Unlike parking areas near the bank, the on-street parking used by employees along Washington Avenue may be causing parking shortages for neighboring commercial establishments which do not have separated customer and employee parking areas. High rates of employee parking with long turnover periods are observed in the same parking groups with noticeable parking shortages near these buildings.